Food Adventures of a Comfort Cook: If you haven’t tried it, how do you know how it tastes? If you haven’t tried it, how do you know how it tastes? In my area, there are three Chinese restaurants; we’ve tried two, haven’t tried the third place yet, and we’re a bit hesitate. Why? The experience of the first two restaurants has jaded both of us. The cuisine is so very different from what we are accustomed to, namely Cantonese style. Out here, the Chinese cooks come mostly from San Francisco’s Chinatown, and cook mainly in the Mandarin style; while the Chinatown of New York City and Philadelphia is primarily Cantonese. So, not only two different dialects, but two different cooking styles. When I ask for a particular dish, well, it’s not exactly what I’m used to, and sometimes, extremely different. Take for example “Chow Fun”, also referred to as “Ho Fun”; a dish made by stir frying a wide rice noodle (about ½” wide) with beef, bean sprouts, Chinese broccoli and, sometimes, onion. I have asked the owners of the restaurants here if they make this dish, and the answer was yes. However, the dish I received, both times, was made with lo mein noodles which are more tubular, like spaghetti, and starchier. Not the same as what I am used to, and very different indeed; and I didn’t particularly care for the taste or texture. My goal, find an online site that makes the wide rice noodle and ships it out. I have the recipe and a wok; now just need the correct ingredients. But it hasn’t been just this dish that is different; the fried rice is not, fried that is, but steamed and has very little flavor to it. The sauces are thinner, less flavorful; the various dim sum are drier. Now maybe it’s the cooks in the restaurants; I really can’t be sure since I have never been to Chinatown in San Francisco and experienced the restaurants there. Then again, what if I had lived most of my life in California, and then gone to Chinatown in New York City and Philadelphia…how would I react to the difference in cooking style? I already know that restaurants out East, that say they serve Southwestern/Mexican cuisine, are far off the mark of the real cooking styles. I know that the Cuban style, very predominant in Florida, is very different from Puerto Rican which is very different from Mexican. I have tried it, so can speak from experience. But what if someone hasn’t tried the different styles; how can they know the difference, appreciate it, and know when they’re being served something completely different? Simple answer is, try it, or you’ll never really know. If you have the opportunity to travel to a place which has a completely different cuisine than you’re used to…try it. Please, stop with the “ewwww”s, or the “not gonna put that in my mouth”; why deny yourself a pleasure because of a little fear and/or ignorance? If you don’t like it, at least you tried it, and don’t have to try it again, unless you’re feeling brave enough for another chance at it. 1) Cut the broccoli stalks in half lengthwise if more than 1/2 inch in diameter. Cut the stalks and leaves into 2 inch-long pieces, keeping the stalks separate from the leaves. 2) Halve the flank steak with the grain into 2 strips. Cut each strip across the grain into 1/4-inch-thick slices. Place in a shallow bowl, add the soy sauce, cornstarch, and rice wine, and stir to combine; set aside. 3) Rinse the black beans in several changes of cold water and drain. In a small bowl, mash the black beans with the back of a wooden spoon. Leaving the noodles as a slab, cut noodles crosswise into 3/4-inch-wide strips. 4) Heat a large wok or skillet over high heat. Add 1 tablespoon oil, ginger and garlic to wok, and stir-fry about 15 to 30 seconds, until fragrant. Add the beef, spreading it in the wok. Cook, undisturbed, 30 seconds to 1 minute, letting the beef begin to brown. Add the mashed black beans and stir-fry 1 to 2 minutes, or until beef is browned but still slightly rare. Transfer to a plate and set aside. Add 1 tablespoon oil into the wok and stir-fry the broccoli stalks for 30 seconds. Add the leaves and 1 teaspoon salt, stir-fry 1 to 2 minutes until the stalks are bright green and the leaves are limp. Transfer to a plate and set aside. Rinse wok and dry it thoroughly. 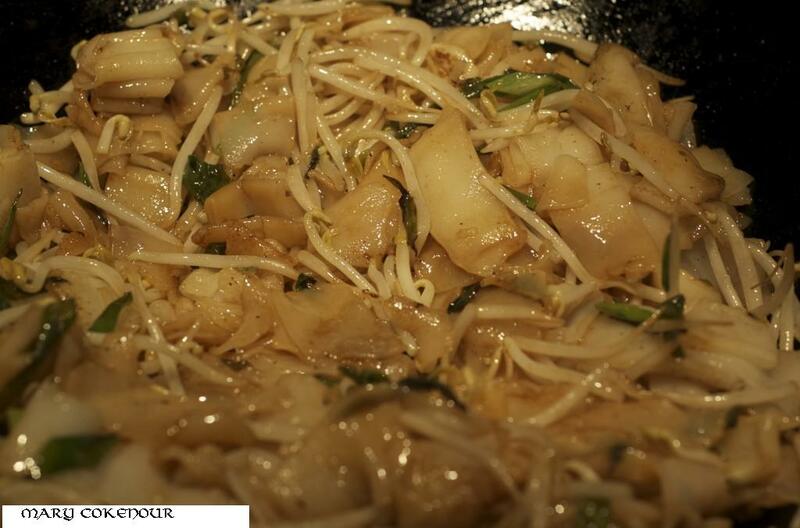 5) Re-heat wok over high heat, add 2 tablespoons oil to the wok with the noodles, spreading them in the wok. Cook undisturbed for 1 minute, or until slightly crusty. Add the bean sprouts and stir-fry 1 to 2 minutes. Return the broccoli and beef with any juices that have accumulated to the wok, add the oyster sauce and scallions, and stir-fry 1 to 2 minutes, or until heated through and well combined. Adjust seasonings to taste and serve immediately.